Summer is a time when extended families gather. Capture the spirit of these special occasions with a Photo Book of your Family Reunion Photos. Today, many of our families are spread across the country or even the world. When family members travel to be with loved ones, these are occasions to commemorate. Don’t miss the opportunity to share your family reunion photography with everyone in your family. 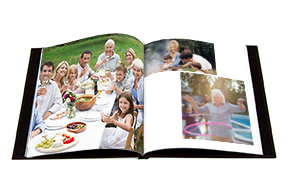 Create a keepsake photo book of your family reunion photos this summer. Present each member of your family with a photo book at the end of your reunion. Or give them as special holiday gifts. Creating a beautiful hardcover photo book that captures the spirit and special moments of your reunion is easier than ever and will be a gift that will be cherished by everyone in your family. Before you sign on to a photo book site, you will want to organize your photos. Trust us when we say that it feels a little like juggling to try to sort through hundreds of photos while laying out your book. Below are some simple steps to help you get started with your Family Reunion Photography Book. Compile all of the photos from your reunion. Have relatives send their best photos. Be careful about using photo-sharing sites. The digital quality of the photos may degrade which will affect print quality. Instead, have your relatives send you their best photos directly from their computer or share them from a Drop Box or other cloud storage. Decide what story you want to tell. Do you want to present the reunion chronologically? Do you want to group photos by family? Do you want to show how each member of your family has changed from one reunion to the next? Collect and organize your photos in folders according to how you would like your family story to flow. This is the easy part. You will be surprised how simple it is to build your book with Clearbooks. Below are the simple steps to creating an awesome Family Reunion Photography Book. Download the free software from Clearstory and open a new project. Choose the type of product you want to create from the options presented. Note: if you want to have text in your photo book, click on the right scroll bar to find and select that option now. Choose the size and cover options. Don’t worry, you can change your mind later. Name your project, perhaps, “Family Name” Reunion 2013. Next you will use the main layout panel, which enables you to view, select and change your layout. Upload your photos simply by clicking the + symbol. You can add individual photos or folders. Your photos will appear on the left side of the page. Click on the Pages Panel to see layout options. Now you can manually place your photos in the layout or simply hit “Autoflow” which automatically inserts page styles and photos. Want to add or rearrange photos? Just drag your photo to where you want it to go. Want to change layout styles for a particular page? Simply drag the layout you want over the one you already have on your screen and the software will automatically arrange your photos for the new layout. Want to add text? Select a layout with text box and add text. Review your pages. Want to change a photo size, position or enhance the color? Want to alter text styles? Simply double click on the photo or text and use the simple picture/text tools to make your changes. Preview your completed photo book. If you decide you want to upgrade your book cover you can easily switch styles directly from the tool bar and your work will automatically transfer. Place your order for the quantities you would like to print for all the members of your family. It is fast and simple to create a stunning Family Reunion Book that each member of your family will cherish forever.